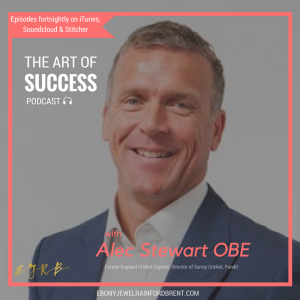 This week on the podcast I sit down with Alec Stewart OBE for England and Surrey Captain and Cricketer to talk about his career and success. Alec is one of the greatest England batsmen of all time becoming one of the most capped England cricketers of all time playing 133 Tests with nearly 8,500 runs and 170 ODI’s with over 4500 runs. Since retiring Alec has gone on to become Direct of Surrey Cricket and a media pundit. This entry was posted in Ebz Blog, Inspiration, Motivation, Peak Performance, Personal Development, Podcast by Ebz. Bookmark the permalink. Sign up for ‘The Art of Success’ podcast, blog updates & news! Copyright © 2019 Welcome to the Website of Ebony-Jewel Rainford-Brent All Rights Reserved.